Great answers, girl! Love the interview. I think our families are feeling along the same lines with the foster care. Looking forward to reading the interview on your blog as well! "I judge, I chose the wrong words at times, and I'm human." Wise words for regular parenting, let alone adoptive parenting. This is absolutely amazing, and as an adoptee myself, it touches me on an emotional level to my very core. Thank you for this wonderful interview, the honesty. 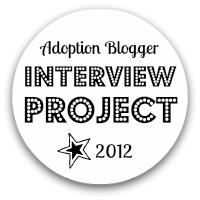 If you're ever looking to feature a fellow adoptee in an interview-- I would be delighted to talk with you. I've had so much fun reading the blogs of your commenters! I look forward to your future posts about adoption as well as life!